If you’re considering laser treatment for a cosmetic procedure you may find that reading about these procedures can be a bit confusing. So simply explained The word laser is an acronym Laser (L-A-S-E-R) stands for light amplification by stimulated emission of radiation. In simpler terms, a laser is a single-wavelength (one colour of light) source of high-energy light, which can be accurately focused to transmit that light onto an area of skin that is being treated.Lasers today are being used to successfully treat a large variety of skin conditions such as lines and wrinkles, acne breakouts, pigmentation, stretchmarks, Rosacea, broken veins on the face and legs, hair removal and scarring to name a few. We Use the Rolls Royce of all Laser machines and we are all very excited to be working with Sciton Joule and BBL laser. This is the Gold standard when it comes to lasers for the skin and is the very first machine of its kind in Cape Town! Our skin and laser specialist Cherie Cochrane has also spent time at some of the leading aesthetics clinics in Beverly hills, Los Angeles and San Francisco to work with some of the top plastic surgeons and Dermatologists in the field. As a team we continue to keep up to date with current techniques, attending seminars and continually researching new technology that is coming out of American and European aesthetic practices, with a commitment to enhancing our knowledge in the future. 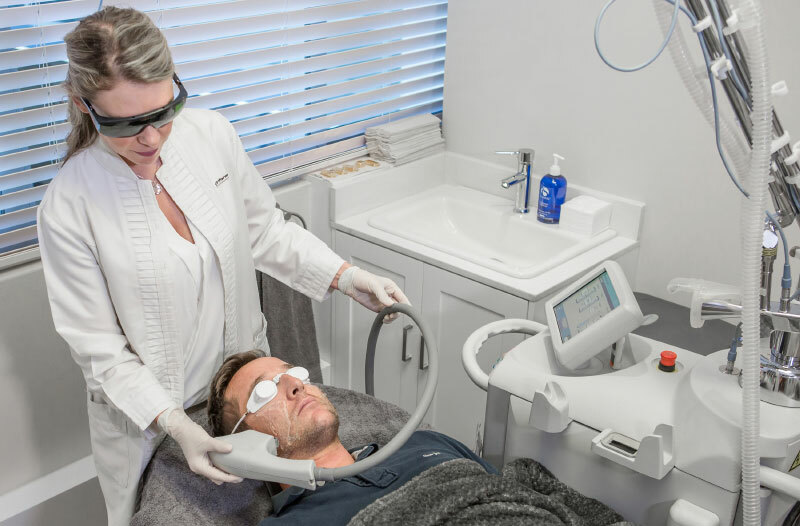 When you visit Atlantic Dermatology and Laser for your initial consultation, our skin specialist Cherie Cochrane will assess the depth of treatment required. From there she will discuss the best treatments for your skin, how many treatments are needed and the healing time if applicable. We are committed to providing you with the most advanced procedures in aesthetic medicine. By integrating the latest cutting-edge lasers and skin devices into our treatments enables us to be ahead of the curve in so many ways and the results we are achieving for our patients really do speak for themselves. Set in the heart of Sea point, Atlantic Dermatology & Laser welcomes patients from all over Cape Town.